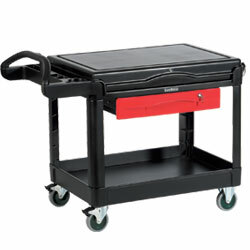 Dependable cart keeps all your tools and supplies close at hand. Features ergonomic handle with built-in storage, multi-compartment parts organizer, 4" locking steel drawer, and side hooks. Includes three-duplex outlet, surge protected power strip with a 15-amp power rating, and a 15' cord. 2 fixed casters, 2 casters with total lock brakes. IN STOCK. XC-1240 85	 2	 14-1/8"	 30-5/8" x 52-1/2"	 37-7/8"